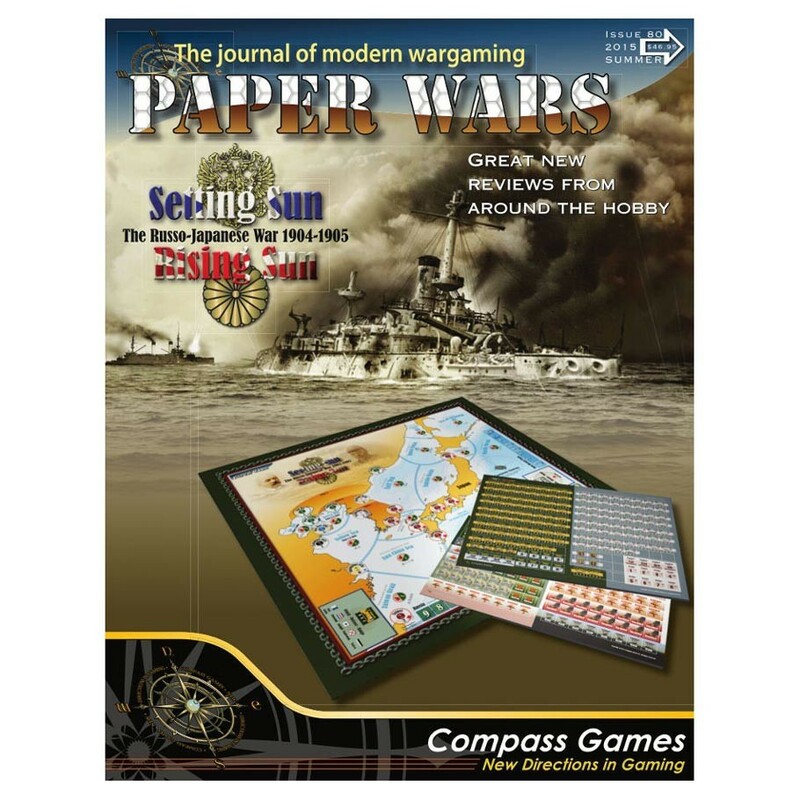 SETTING SUN, RISING SUN is an uncomplicated war game centered on the naval aspects of the Russo-Japanese War of 1904-1905. The game depicts this conflict at a strategic level, with most operational and tactical details represented by fast and easy-to-play systems, rather than intricate mechanisms. The intent of the game is to provide a broad overview of the historical events while being fun to play. The object of the game for the Japanese player is to control the sea areas around Japan to prevent Russian combatants from bombarding and cutting off supplies to the island nation, and to destroy the naval forces of Russia. The object of the game for the Russian player is to disrupt Japanese sea control, retain sea control around the Russian and Manchurian coastline for as long as possible, and destroy Japanese naval forces. Both players must obtain their objectives by deploying their naval resources into the sea areas on the map, earning victory points at the end of each of six turns for areas under their control, and for opposing units destroyed. SETTING SUN, RISING SUN owes its original inspiration to WAR AT SEA, designed by Jon Edwards and Don Greenwood and published by The Avalon Hill Game Company, a game which covered the war in the Atlantic in World War Two. SETTING SUN, RISING SUN borrows a number of concepts from this earlier game as a starting point, such as area movement, individual capital ships, battle line resolutions, and rolling sixes to hit, and then diverges significantly to reflect the Russo-Japanese War situation. The game includes about 280 counters, a 22"x28" map sheet of the combat areas including charts and tables, and a set of rules to play the game. Design by Stephen Newberg.